Ryder Cup star urges Hazard to remain at Chelsea. Ryder Cup star Justin Rose has beckoned on Belgian playmaker Eden Hazard to commit his future to Chelsea. 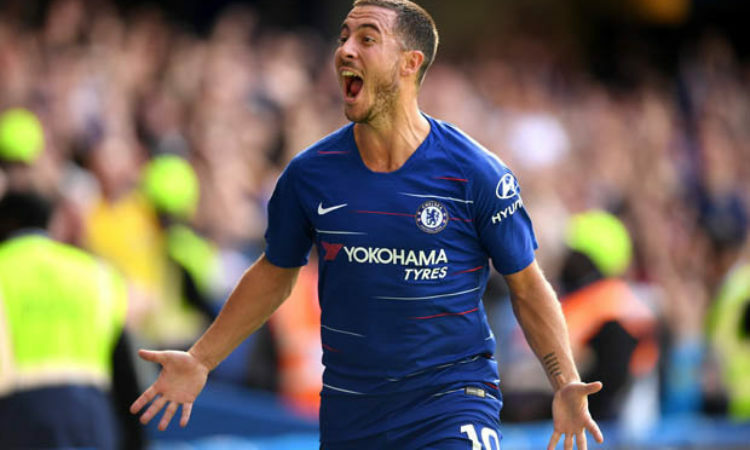 Eden Hazard currently enjoys a superb form with the Belgian netted 10 goals in 12 games of the current football calendar, and this has made him to remain a Real Madrid’s radar. Eden Hazard on Monday, admitted that he would like to grace the famous white jersey of the Los Blancos though happy at Chelsea. He said: “I don’t want to lie, it is my dream since I was a kid. We will see. I don’t want to talk about this every day. I don’t have time, but we will talk about my future soon. “In my head, sometimes I wake up in the morning and think I want to go. Sometimes I think I want to stay. It is a hard decision. It is my future”. However World number 2 golf player Justin Rose, who is also a supporter of Chelsea football club hopes the Belgian international remains at the Bridge despite his Madrid dream. Ryder in an interview with Sky Sports, said: “Stay. He’s obviously been unbelievable, hasn’t he?” “He’s a player that I think even if you’re not a Chelsea fan you enjoy watching him play football, he’s incredible”. “He does so much for us and when he’s engaged mentally and if he has a good reason to stay he’ll be unbelievable for us still in the future”. “Hopefully they can entice to (stay) and keep him motivated”.